Everyone needs clothes, and savvy shoppers know you don't have to pay retail to look good. I once met a lumber "baroness" who confided in me that she bought all of her clothes at yard sales. Good quality holds up, and regular yard sale shoppers know that. For women's and men's, hang clothes up on a rack, rather than folded on a table or in a box. It makes it much easier for people to go through it, as well as to examine it for stains or tears. For kids' clothing, folding it is fine, but it's nice if the sizes are noted and sorted. Many garage-sale shoppers are resellers, and they may take you up on a "$__ per bag" offer. My husband is like a moth to a flame when it comes to a garage sale with tools. He not only likes power tools, but also older, vintage ones that are not only still useful, but fun to collect and display. When selling your old tools, have a power strip nearby so power tools can be tested, or have them charged up if used with a battery. If you live in a college town, furniture is sure to go fast. Also, with DIY projects soaring in popularity, more people are looking for furniture that can be remade. Bookshelves will always sell — even old, beat up bookcases can be used for storage! Make sure any furniture you sell is clean. Old leather furniture can be spiffed up using a mixture of vinegar, olive oil, and a little lemon juice. Vacuum upholstered furniture and treat any spots. Also, suggest a price, but be open to negotiation. Any Pyrex collectors out there? How about milk glass, or Spode? You may have some items hidden away in your cupboards that are hot. Spring fever also means that home gardeners are eager to start tilling, trimming, planting, and digging. Be prepared to start up that old lawn mower, or be honest about what isn't working. Handy folks may be willing to take a chance that they can get a broken item running again. We just bought a garden tiller for $15. It wasn't running, but my husband knew how to fix it. Sometimes, a shovel blade or rake may be fine, but the wooden handles are rotting. You can purchase new handles at Home Depot or Lowe's. But price these items accordingly, if a replacement is going to be necessary. Think nobody would want to buy your old shoes? Guess again. Shoes, especially if in good condition and carrying a popular brand name, sell like hot cakes at garage sales. Kids grow out of shoes so fast that size doesn't matter. If they're too big now, they'll probably grow into them later. Handbags are also enormously popular — especially if it's a designer label. When selling shoes or old purses, obviously, clean and odor-free are necessities. If you still have the original boxes, that's a plus. The key factor with shoes and bags is showcasing any designer brands. Put the designers in your garage sale ad, and place them front and center during the sale. Then watch the flock of shoppers arrive. 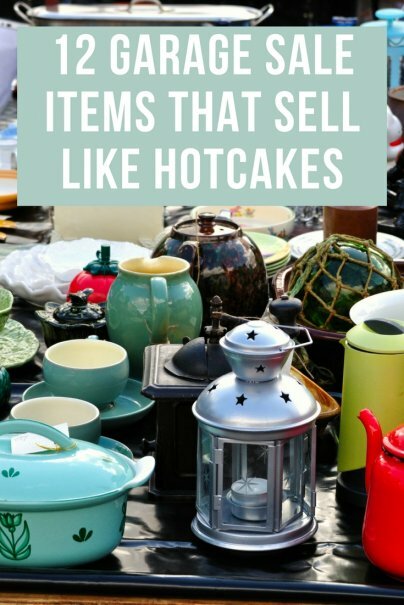 If your jewelry box is overflowing with costume jewelry and statement pieces you know you'll never wear, a garage sale is the perfect place to unload them. Find a rack of some sort to hang necklaces on (a coat hanger will do, in a pinch). Bracelets can go on a dowel. Just make sure to keep costume jewelry close to your cashier area because sadly, some folks will try to pocket it. Have too many toys and games cluttering up the house? Give them a new home by selling them at your garage sale. Vintage games being popular at the moment, you should be able to easily sell Monopoly or Life. Before you sell these, make sure you have all the game pieces. "Lil' Tykes" plastic furniture is always popular, too. Pump up bike tires for bikes you're looking to unload, and give them a wash. It doesn't matter how fancy or state-of-the-art e-readers become — actual books will always be easy to sell. Make the ones you no longer want super cheap — $1–$3 each — and they'll fly off your shelves. I know, you just had to have a Magic Bullet, or a bread-maker, or a hand blender. And now they're sitting on your kitchen counter, collecting dust. I'm guilty of this, too. Luckily, people love appliances, and you can probably unload them. When you sell them, it's a good idea to have a power strip handy so folks can make sure they work. They should also be spotlessly clean. Check eBay to see what they're going for before pricing. Purchasing new camping gear gets a little pricey. However, used gear is usually still in decent condition, since it only usually gets used a few times each year. Yard and garage sales are the best places to get it, and smart shoppers will snap it up. Make sure to mention the items in your ad and include pictures. Open up tents so people can see the size. So, you bought that trendy elliptical machine when you were still clutching the remains of your fitness resolutions. If you didn't use it, that's OK! time to get it out of your garage and into someone else's. Specify what you have, and put pictures in your ad. Basic exercise equipment, like weights, will usually go quickly, but older treadmills or exercise bikes may linger, depending on how you price them and how quickly you want to get rid of them.